Everybody loves a good story, something that grips us from the beginning, touches our heart and takes us to a suspenseful or satisfying ending. In sales, a story told adds another layer of value to a product and encourages the client to make that purchase with a meaningful experience. Now, that story told will live in the minds of anyone that client shares it to and could possibly turn them into prospects and new clients for the seller. 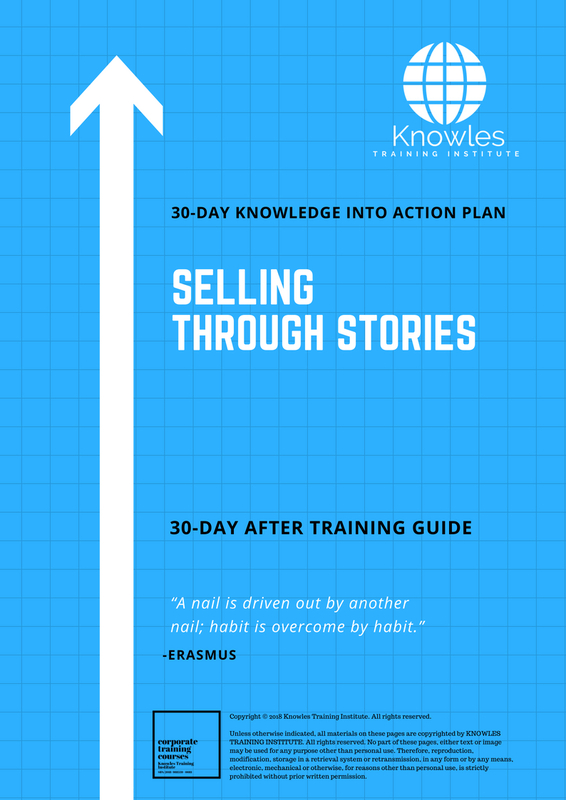 This Selling Through Stories workshop is ideal for anyone who would like to gain a strong grasp and improve their Selling Through Stories. The duration of this Selling Through Stories workshop is 1 full day. Knowles Training Institute will also be able to contextualised this workshop according to different durations; 2 full days, 1 day, half day, 90 minutes and 60 minutes. 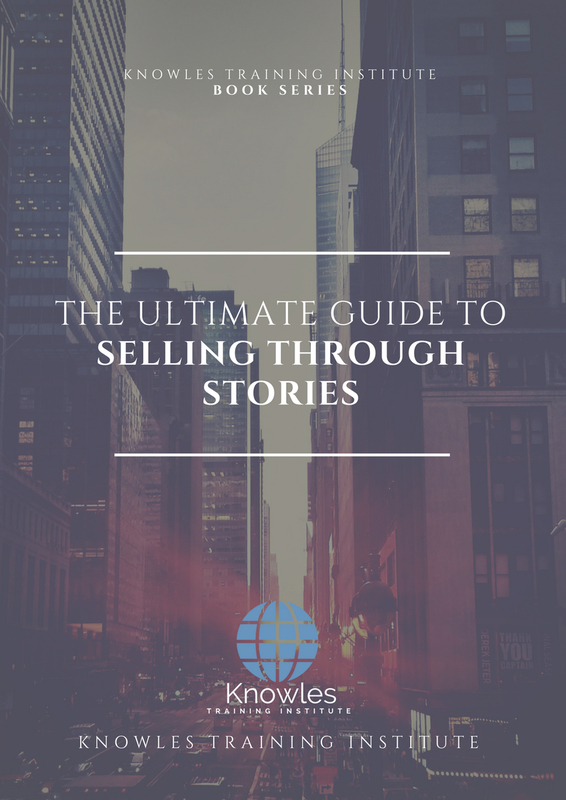 • Why is selling through stories an effective way of selling? • What makes a good story when selling? 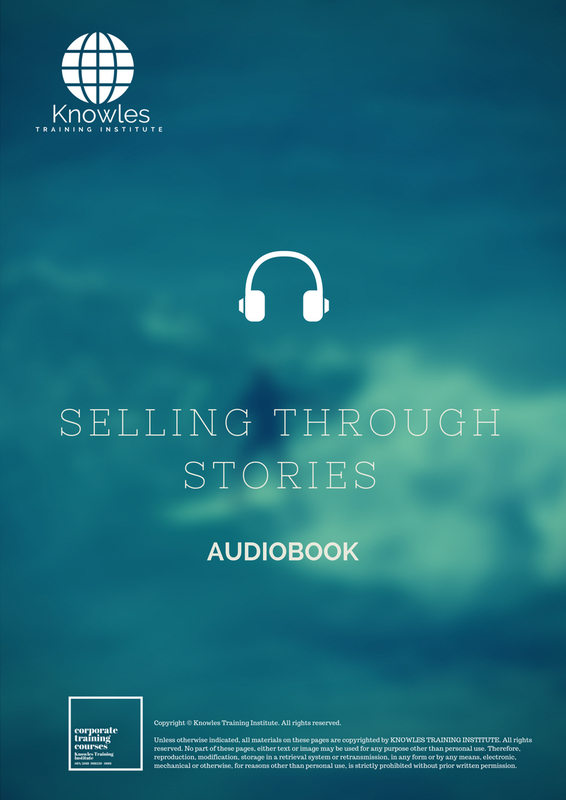 • What are the problems you could encounter when selling your products through stories? 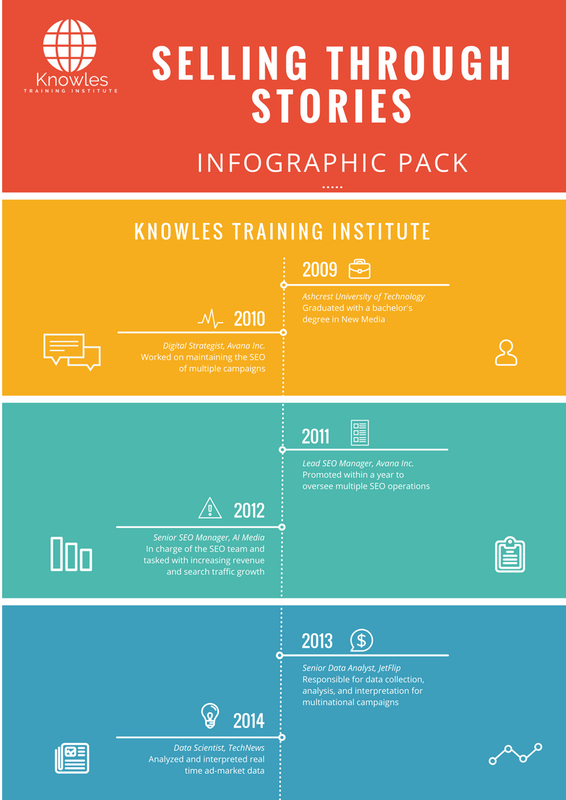 • What are the benefits of using stories when selling? • Activity: Think of a personal experience and turn it into a story. Then, relate it with a product or service of your choice and sell your story to the class. 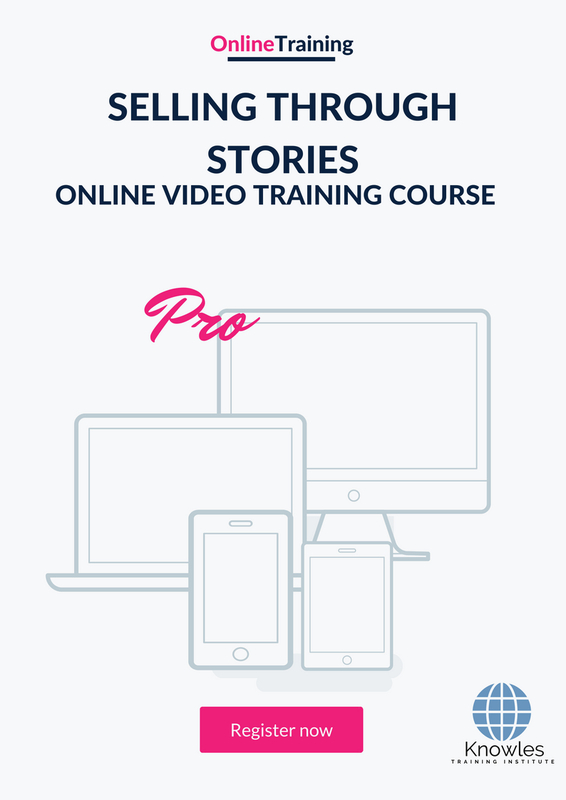 There are 3 pricing options available for this Selling Through Stories training course. 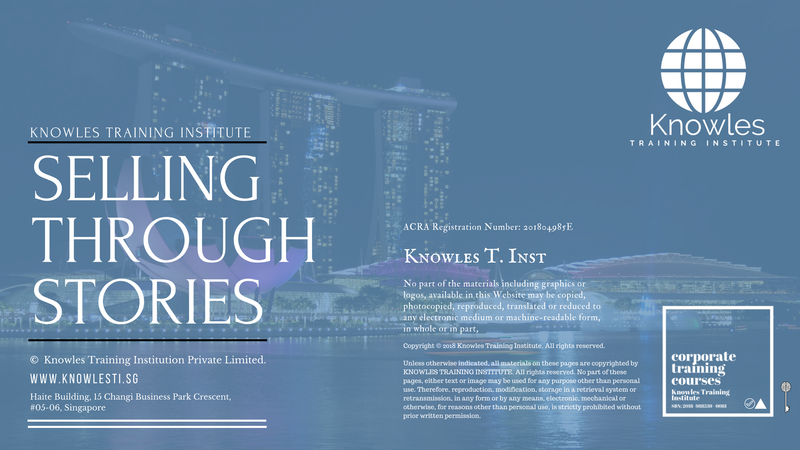 Course participants not in Singapore may choose to sign up for our online Selling Through Stories training course. 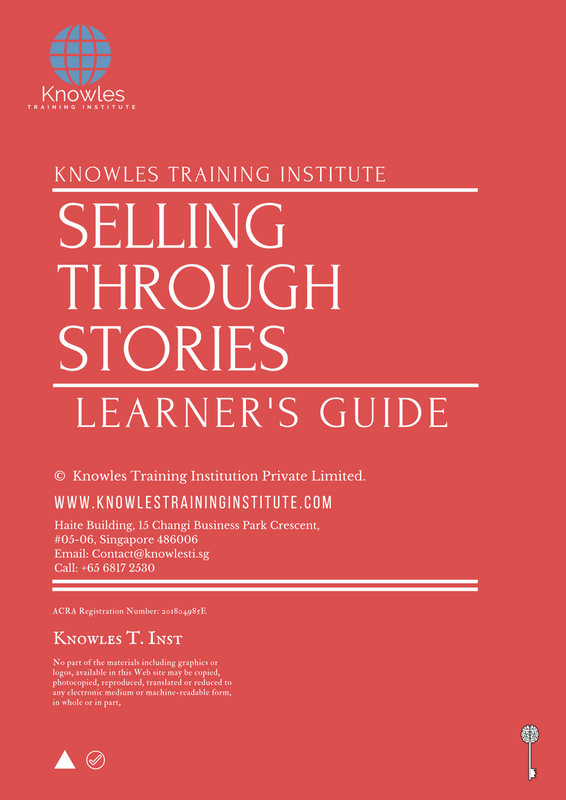 Request for this Selling Through Stories course brochure. Fill up the short information below and we will send it to you right away! 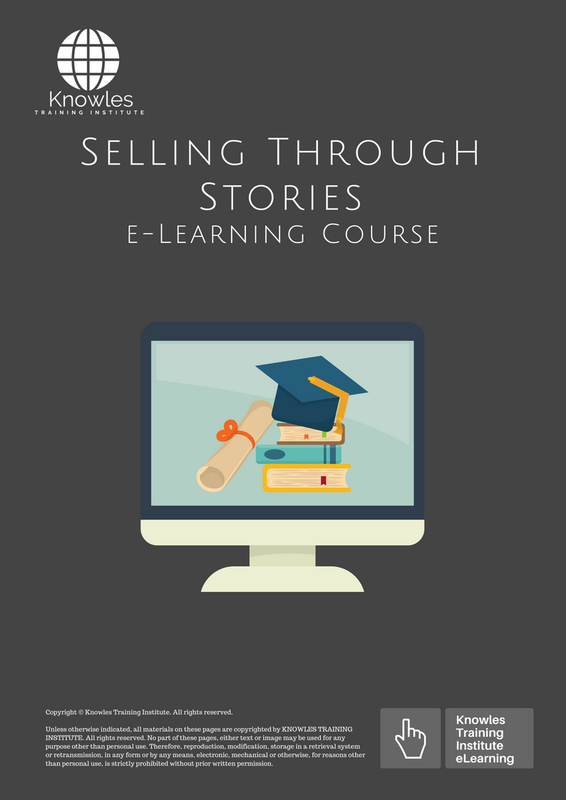 Register For This Selling Through Stories Course Now! 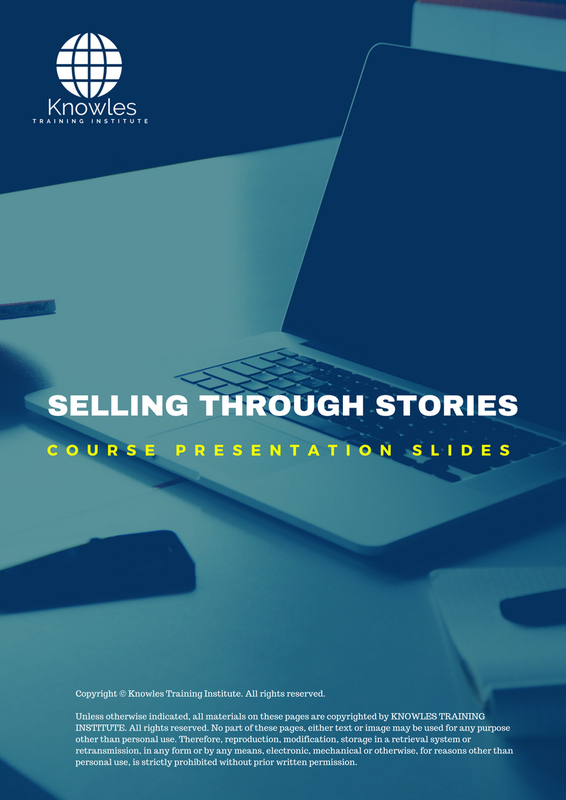 Share This Selling Through Stories Training Course! 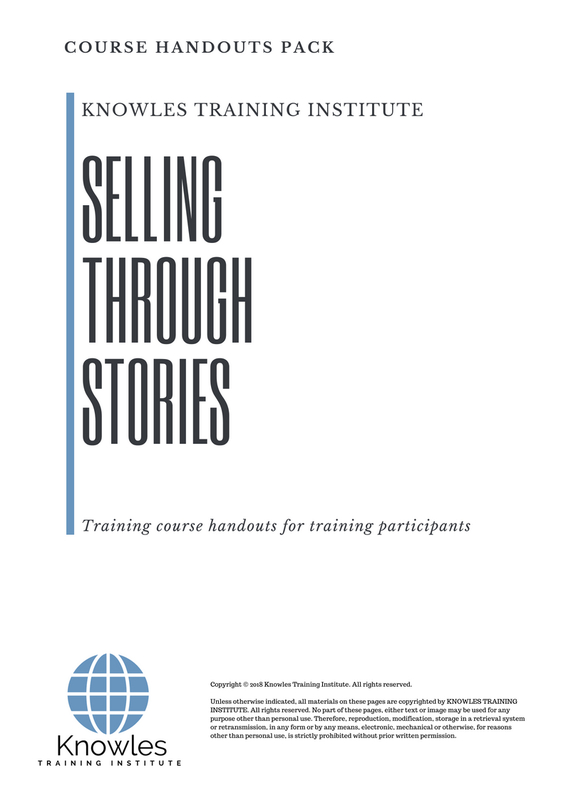 Selling Through Stories course, workshop, training, class, seminar, talk, program, programme, activity, lecture. 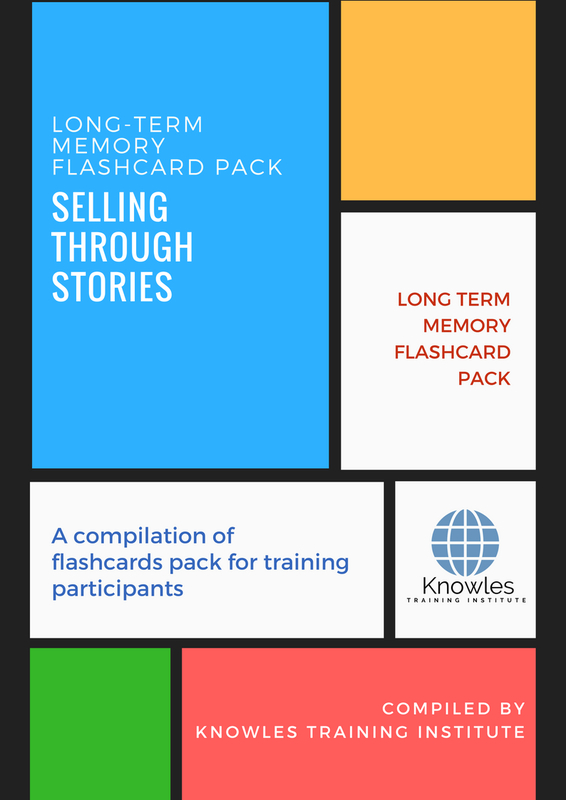 Selling Through Stories courses, workshops, classes, seminars, talks, programs, programmes, activities, lectures in Singapore. Selling Through Stories improvement tips, Selling Through Stories techniques, improve Selling Through Stories, improve Selling Through Stories games, Selling Through Stories improvement exercises, improve Selling Through Stories power, how to have good Selling Through Stories, how to have good Selling Through Stories in studying, how to build up your Selling Through Stories, how to improve Selling Through Stories how to improve Selling Through Stories course in Singapore. Enhance, boost, build up, enlarge, heighten Selling Through Stories course in Singapore. Increase, intensify, raise, reinforce, strengthen Selling Through Stories. Upgrade, amplify, boom, elevate, exaggerate, magnify, grow, gain Selling Through Stories. 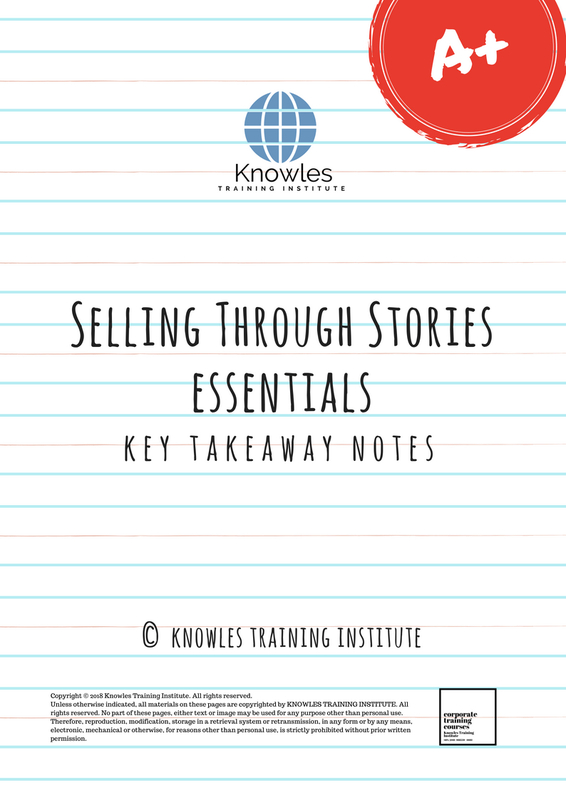 Develop Selling Through Stories, multiple, power up, beef up, bolster, establish, extend Selling Through Stories. Invigorate, restore, step up, toughen, empower, fortify, regenerate Selling Through Stories. Rejuvenate, renew, escalate, expand, maximize Selling Through Stories. Powerful, mighty, impressive, competent, great, excellent, exceptional Selling Through Stories in Singapore. Superb Selling Through Stories. 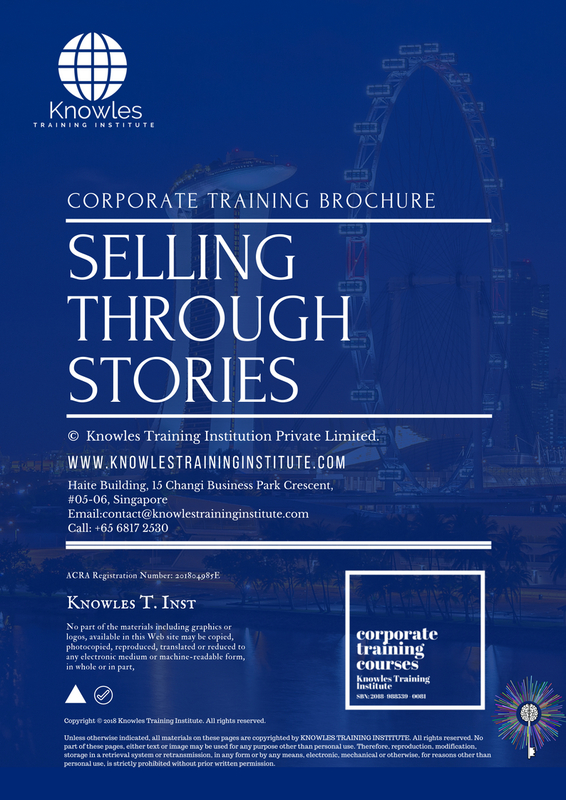 Super, superior, strong, solid, active Selling Through Stories training courses and workshops in Singapore. Selling Through Stories enhancement, booster, building up, enlargement, heightening, increment, strengthening, amplification. Selling Through Stories magnification, growth, development, power, empowerment, regeneration. Selling Through Stories rejuvenation, development, escalation, expansion. 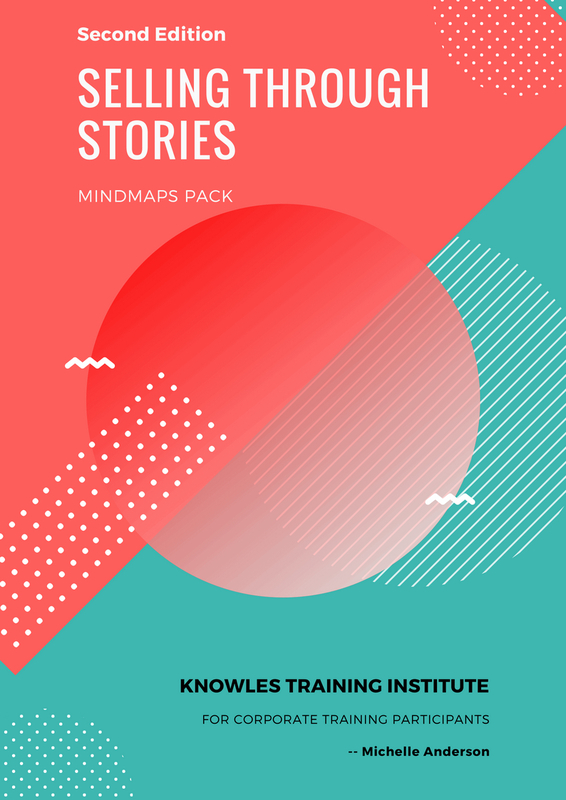 Selling Through Stories maximization, power training courses & workshops in Singapore.